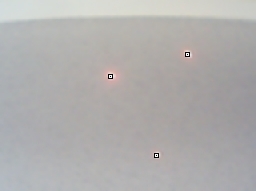 The Laser Spot module provides an easy way to identify a red laser spot within the current image. The detection routine looks for characteristics that indicate the presence of a red spot that include intensity, color and shape. The module will graphically indicate the location of the laser dots and also create a LASER_POINTS variable array that holds the X,Y locations of the detected spots. This module can be used with handheld lasers such as those sold by OrbTronic. 1. Minimum Size - Specify the smallest laser dot that you would like to detect. If you notice that your image has many incorrectly detected laser dots try increasing the minimum size which will make the detection much less sensitive to noise. 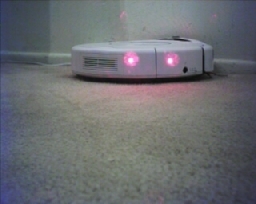 Often noisy pixels can be detected as very small laser spots. 2. 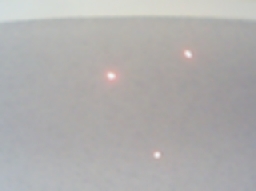 Maximum Size - Similar to minimum size the maximum size of the laser spot can be set. 3. Isolation Distance - Specify how close each laser dot can be to other laser dots. Because laser points include noise the detector may decide that one laser dot is in fact more than one. 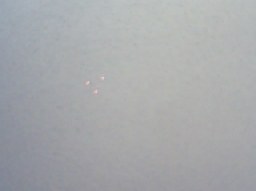 Using the isolation distance you can prevent laser dots from "clumping" together due to noisy detection. 4. Intensity threshold - Laser dots are typically higher in intensity than most (but not all) other parts of the image. Use the intensity threshold if you are unable to detect the laser dot (due to a weak laser) and need to decrease the recognized intensity. Likewise, if too many dots are identified try increasing the value to eliminate bad matches. 5. Color threshold - This module detects red laser dots only. Reduce this threshold if your red dot is not getting recognized. Increase it if too many dots are being identified. 7. Shape, Color, Size - Specify the shape, color and size of the graphic that is used to indicate the point location. Note the default is the outline shape which has a set size and color. 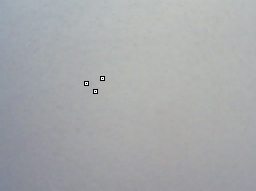 LASER_POINTS - an X,Y array (even numbered array) that contains the X,Y locations of each identified laser dot. Sending data from roborealm to arduino?